Dan Aykroyd, the Canadian comic master behind Ghostbusters, Saturday Night Live, and The Blues Brothers, is a UFOlogist. Now that Aykroyd is essentially retired from the comedy game, he spends his time researching paranormal activity, alien abductions, and UFOs from his haunted farmhouse in Canada. Aykroyd has no qualms being open about his belief in the obscure and occult – he talks about it freely. Some even refer to him as a master of the subject. So, what does it take to be a paranormal master? According to Aykroyd: a lifetime of commitment to the truth, and a family that believes in uncovering the mysteries of the universe. Aykroyd isn’t some Johnny-come-lately to the paranormal investigation game. The Aykroyds have been searching for the truth about ghosts for a while. Their history dates back to the comedian’s great-grandfather, who was a spiritualist and dentist. Aykroyd still lives in the family farmhouse that has been host to seances and spiritualist get-togethers for decades. Aykroyd says the house has “a history of spiritual activity that would blow your mind.” Despite living in the spooky farmhouse, he’s yet to have direct experience with an apparition as an adult. One of the many houses owned by Aykroyd is a Los Angeles bungalow, where notable musicians like Mama Cass (The Mamas and the Papas) and Ringo Starr lived in the ’60s and ’70s. When Aykroyd lived in the home, he claimed a ghost – which he believes to be the spirit of Mama Cass – was haunting the place because someone would turn on his StairMaster and mess with the family jewelry. It once even crawled into bed with me. I rolled over and just nuzzled up to whatever it was and went back to sleep… I’m sure it’s Mama Cass because you get the feeling it’s a big ghost. I can’t say that they are alien craft and neither can the Air Force. The Air Force has been very interested in this. They don’t deny the existence of these hyper-dynamic, super aerodynamic craft. On November 7, 2006, an employee at O’Hare International Airport allegedly saw a large disc floating in the middle of their airspace and recorded footage of the event. The footage never turned up, but Aykroyd supposedly has it. He claimed to have purchased the footage from a tarmac worker. After announcing he had the footage, Aykroyd alleged he would be releasing a DVD with the never-before-seen footage and photographs. Some of it made it into his documentary, Dan Aykroyd Unplugged On UFOs. Many people believe aliens are flying through our skies at night, but Aykroyd believes extraterrestrials are already here and living among us. In 2010, he appeared on Larry King Live and made the claim we’re living in a They Live scenario, albeit without the cool sunglasses. While Aykroyd admits he’s had somewhat bad luck with seeing full-body apparitions as an adult, as a child he was apparently a ghost magnet. He claimed that when he was a kid, there was a time when his mother, a skeptic, actually saw the ghosts of his great-grandparents watching him sleep. My mother speaks about a time when she was nursing me, and an old couple came to the end of the bed. The image faded away. She pulled out an album and saw that it was my great-grandfather Sam and Jenny, his wife, coming to approve the new child. In 2006, Graviton Productions released the documentary Dan Aykroyd Unplugged On UFOs. 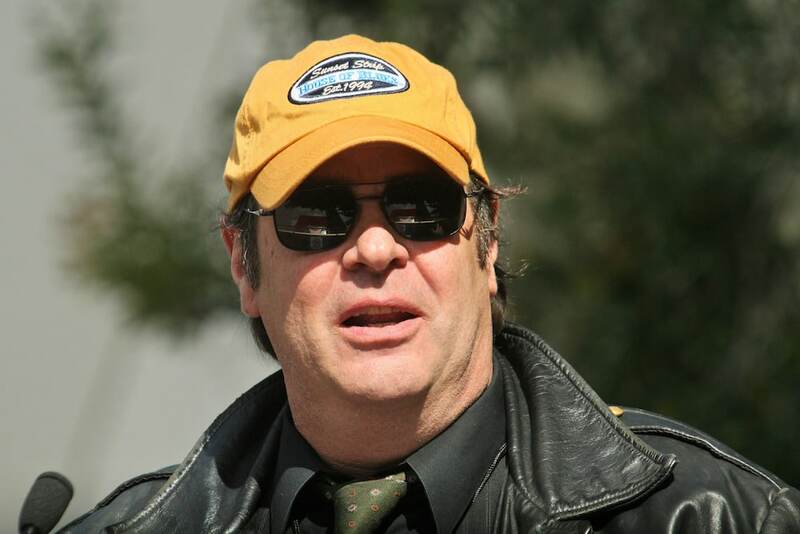 The film follows Aykroyd as he talks with author and fellow UFOlogist David Sereda about the potential existence of alien life. The documentary also features interviews and footage from the likes of astronaut Gordon Cooper, NASA engineer John F. Schuessler, and President Ronald Reagan. As much as Aykroyd loves the fantastical elements that go along with hunting ghosts and UFOlogy, he also believes there should be more legitimate science applied to parapsychology. He thinks there would be major discoveries if physicists began analyzing ghosts. When Aykroyd introduced Crystal Head Vodka in 2008, he was making a direct reference to the legend of the Crystal Skulls that also appeared in the movie Indiana Jones and the Kingdom of the Crystal Skull. Before rolling out the vodka, Aykroyd said he was nervous about incurring the wrath of Steven Spielberg. Fortunately, when the two met to talk about their similarly named products, Spielberg requested the vodka be served at the film premiere. Much of the material in the book was recorded by Peter Aykroyd and his father, Samuel Aykroyd, during séances. While researching the book, Peter Aykroyd found the notes locked in a trunk and began working them into the book. Since Aykroyd comes from a family of parapsychologists and paranormal investigators, you might think they were tough on him for taking the family business and turning it into a comedy goldmine in Ghostbusters. That’s not the case, said Aykroyd. His father, Peter, was “elated” with the film and thought that the opening scene where a ghost completely wrecks the basement of the New York Public Library was incredibly accurate. Peter Aykroyd told the Daily Beast, “It was a pure poltergeist phenomenon and absolutely true to form. Let’s face it, he was writing this thing from conviction. There was truth in that, even though it seemed fantastic.” As much as Peter thought the opening scene was an accurate depiction of a poltergeist, he did feel the Stay Puft Marshmallow Man was a bit much.